Having problems pairing a device? Let's figure out what's going on with your device to get you back up and running. We have detailed walkthroughs for all the different types of devices along with individual troubleshooting for different types of devices. If TrainerRoad can't find your ANT+ USB Stick we have a troubleshooting article to help you get going. If TrainerRoad can't detect your Bluetooth Smart (4.0) devices on your computer we have an article that will help you with the system and hardware requirements. ANT+ and Bluetooth both operate on 2.4 ghz and can be affected by WiFi routers, microwaves and other bluetooth devices. If you're having pairing/drop out issues it's best to eliminate these variables and then bring them back one at a time. If you find that a WiFi router is interfering, read our WiFi troubleshooting article. If you are still experiencing problems please check out our device dropout article. When a device battery gets low, the reception gets worse. Try replacing the device battery. 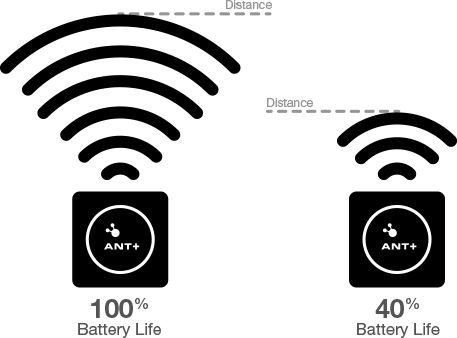 Some devices report their battery condition over ANT+ and we display that on the Devices page. But it is not a universal feature, and speed/cadence sensors can't report it due to a protocol limitation. If your head unit picks up the signal, but TrainerRoad does not, try moving your bike setup closer to your ANT+ USB stick. Sometimes a couple feet can make a big difference. Drop us a line at support@trainerroad.com and we'll get any device pairing issues you have sorted out.